Module 1 – The Manual: This eBook includes everything that you’ll need to know to build a large list fast…and for free. Module 2 – The Checklist: An abbreviated version of the manual. Print it off and keep it close at hand for a quick reference. As you work your way through the manual, check off all of the completed steps on your way to building your profitable subscriber list. Module 3 – The V.I.P. Forum: A private social community where List Laundering members can share tips, offer inspiration and discuss their success stories. Module 4 – The Videos: No course is complete without accompanying videos. Get an inside view on how Alan runs his online business. If you like to learn by watching then you may want to consider this module. Module 4 – A 30 Minute Consultation: To supplement the manuals, videos and community forum is a 30 minute consultation with Alan’s staff of experts. 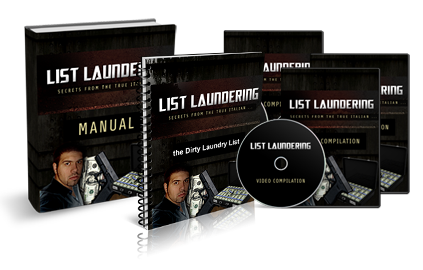 For a limited time, List Laundering will be available as a 7 day trial for only $4.95. Click here to for your $4.95 trial and to begin building your list.